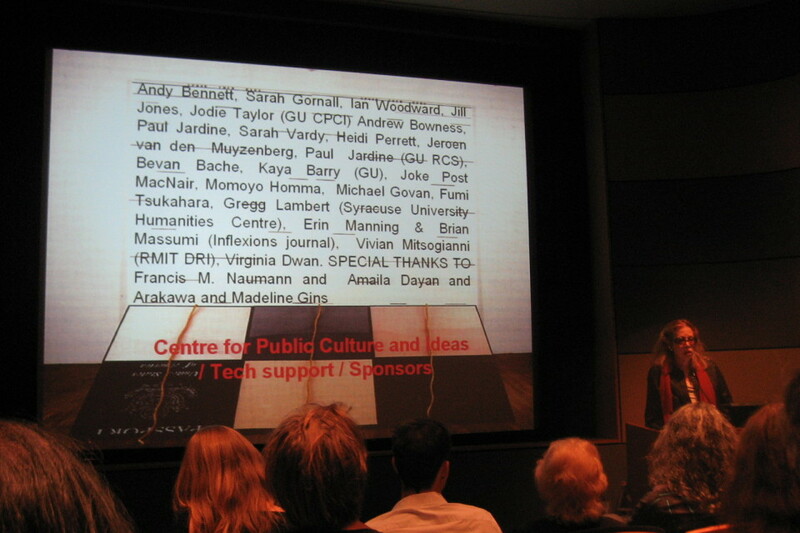 ** AG3 Online was hosted by Griffith University’s Centre for Public Culture and Ideas. This site is an archival reconstruction using the original data provided by and with the permission of the then-Centre Director, Professor Andy Bennett. [The Centre for Public Culture and Ideas (CPCI) was renamed the Centre for Cultural Research (CCR) in 2008 and is now the Griffith Centre for Social and Cultural Reseasrch (GCSCR 2016-)]. The web design has been lost along with the texts from the live-chat sessions and the asynchronous forums. However, in future, the papers originally posted on AG3 Online will become available and a selection of papers from the conference has been published in Inflexions journal #6 (2012). 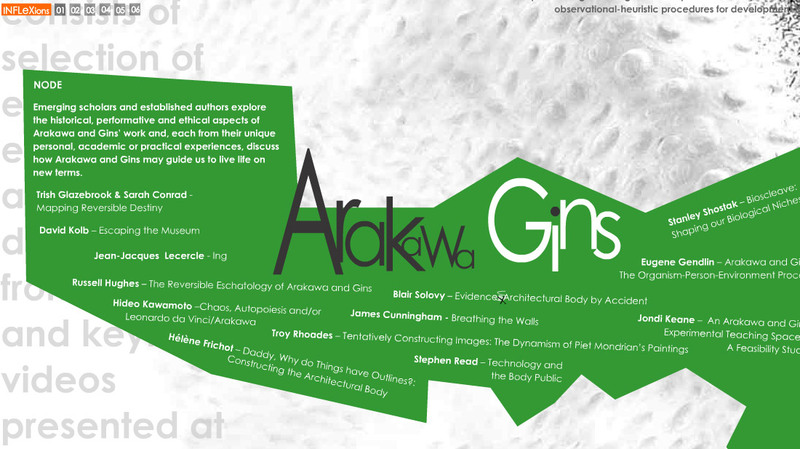 AG3, the first on-line Arakawa and Gins conference, will continue to explore the practical approaches and research perspectives presented by Arakawa and Gins’ writing and procedural architecture. The First International Arakawa and Gins: Architecture and Philosophy conference was hosted by University of Paris X, Nanterre and (organized by Jean–Jacques Lecercle and Francois Kral in 2005) and the second, hosted by the University of Pennsylvania and the Slought Foundation in Philadelphia (organized by Aaron Levy and Jean-Michel Rabaté 2008) brought together scholars and practitioners excited by the embodied solutions Arakawa and Gins bring to the issues facing the 21st century: health, ageing, sustainability and the relationship between the organism and the environment. This conference will foreground research that enacts the connections between Arakawa and Gins’ project and disciplinary research in addition to articulating the relation between interdisciplinary collaborations and actual or envisioned projects in community housing, age care, health and daily research. This approach to collective productivity is what Arakawa and Gins call ‘daily research’. AG3 conference aims to develop the multi-disciplinary engagements that begin to implement new connections across the organism-person-surround necessary for life on new terms. The conference committee encourages scholars, researchers, creative practitioners and industry professionals to discuss their current Arakawa and Gins inspired projects in relation to larger issues of community, creativity, environment, sustainability and leadership. The decision to hold the conference events online speaks to the ecological impact of travel and consumption that international conferences require. While interaction online is not the same as face-to-face dialogue, it does permit a greater access to the proceedings and a greater choice when participating in the conference events and forums. Perhaps the next conference will travel to the built-environments devised by Arakawa and Gins to highlight more the need to balance the potential opened by AG project with first-person experience and perceptual learning. Co-Organizers: Jondi Keane and Martin E. Rosenberg. Conference Committee: Trish Glazebrook, Russell Hughes and Bobby George. The papers originally posted on AG3 Online will become available and a selection of papers from the conference has been published in Inflexions journal #6 (2012). AG3 Online: Conference Events: March 12 to March 26, 2010. AG3 Conference: Closing Celebrations: April 29, May 1st and May 2nd, 2010. Concluding celebration of the two-week digital academic conference AG3-Online: The Third International Arakawa and Gins: Architecture and Philosophy Conference, held at Barnard College on April 29, 2010. On the first day, a group of scholars and practitioners convened at Barnard College Madeline Gins’ alma mater [http://barnard.edu/]. 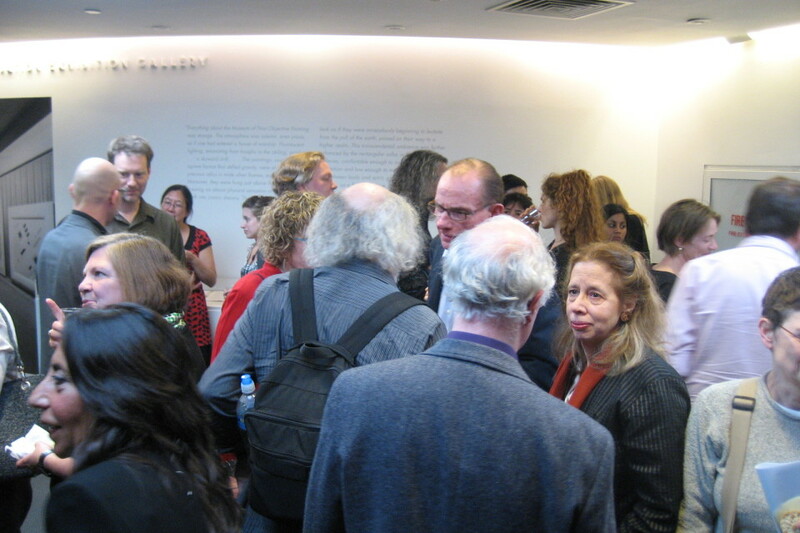 The occasion was presided over by Serge Gavronsky, with Martin Rosenberg and Jondi Keane as masters of ceremonies introducing the scholarly papers by Trish Glazebrook, Reuben and Joan Baron and Gordon Bearn followed by numerous performative pieces by George Quasha, Charles Bernstein, Ilse Pfiefer, Daria Fain and Melissa Smedley. a distinguished dais that included Alexandra Munroe and featured scholar and artists: Mary Ann Caws (CUNY), Don Ihde (SUNY Stonybrook), Gregory Lambert (Director, Syracuse Humanities Center), David Kolb (Bates C.), Stanley Shostak (U. Pittsburgh), Erin Manning (Concordia U. ), Brian Massumi (U. Montreal), Mackenzie Wark (The New School), Don Byrd (SUNY Albany), artist/theorist Jondi Keane (Griffith U. ), and science studies scholar Martin E. Rosenberg (Independent) and , of course, Madeline Gins. These NY events coincided with two major exhibitions in Japan. The National Museum of Art in Osaka, exhibited Arakawa’s early “coffin” works from April to June 2010. The Kyoto Institute of Technology held an Arakawa and Gins exhibition was held from May until June 2010. The structure of the online conference consisted of recorded introductions, keynotes video, a welcome by Madeline and extra videos by RMIT architecture students and Momoyo Homma. There were 5 conference keynotes that addressed a range of ideas, practices and issues raised by AG. There were also 7 conference streams with an invited presenter for each Stream. All the video presenters were introduced by members of the conference team. After each keynote video there was alive chat (2 hours) followed by an asynchronous forum, which continued throughout the duration of the conference. An online creative exhibition was curated by Alan Prohn, Bill Lavender and Jason Nelson and face-to-face closing events were held at Barnard and the Guggenheim. In a recent paper entitled Choreography as Mobile Architecture, I explore the vibratory field of cues and alignments as they create spacetimes for movement in William Forsythe’s choreography One Flat Thing, Reproduced (as documented on the synchronous objects website, www.synchronousobjects.org). What fascinates me about the idea of cues and alignments is how they activate a field of relation rather than starting or stopping at one particular human body. Often the idea of cue is used to denote a starting point for a movement, and the notion of alignment an effect of the cue-as-cause. What I attempt to demonstrate in Choreography as Mobile Architecture is that in fact the cue-alignment assemblage is an enabling constraint for the movement of the interval of dance itself. A body’s cue never lands strictly on a body’s alignment. What is danced is the in-between of the cueing itself as it aligns on the dance as a whole. What emerges is an intensive diagram – a mobile architecture – that in turn dances the bodies of the dancers. Not body initiating, but body relating. This is what I call a dance of attention: not the attentiveness of a particular body to the cue/alignment, but the attentiveness of the mobile architecture as it constructs a performance in the making. A more-than-human intervention into the spacetime of human bodies. For the Making of a Theory conference, I would like to delve deeper into the idea of the dance of attention, exploring the constraints that allow for the emergence of such mobile architectures. In the second part of the Choreography as Mobile Architecture paper, I explore how relational environments for participatory interaction open the dance of attention to different kind of dynamics (as opposed to the more stable dynamics of a rehearsed choreography). In this paper, I will explore how the architecture of Arakawa and Gins itself proposes dances of attention, and delve into the idea that these dances of attention in turn propose articulations for a politics of performance. Erin Manning holds a University Research Chair in the Faculty of Fine Arts at Concordia University (Montreal, Canada). She is also the director of the Sense Lab (www.senselab.ca), a laboratory that explores the intersections between art practice and philosophy through the matrix of the sensing body in movement. In her art practice she works between painting, fabric and sculpture (http://www.erinmovement.com). Her current project entitled Folds to Infinity is an experimental fabric collection composed of cuts that connect in an infinity of ways, folding in to create clothing and out to create environmental architectures. The next phase of this project will explore the resonance between electromagnetic fields and movement through the activation of the existent magnets in Folds to Infinity. Her writing addresses the senses, philosophy and politics, articulating the relation between experience, thought and politics in a transdisciplinary framework moving between dance and new technology, the political and micropolitics of sensation, performance art, and the current convergence of cinema, animation and new media. Publications include Relationscapes: Movement, Art, Philosophy (Cambridge, Mass. : MIT Press, 2009), Politics of Touch: Sense, Movement, Sovereignty (Minneapolis: Minnesota University Press, 2007) and Ephemeral Territories: Representing Nation, Home and Identity in Canada (Minneapolis: Minnesota University Press, 2003). Arakawa's trajectory from the "Coffin" series and the "Diagram" paintings (1960s) to the recent architectural works, "Reversible Destiny Lofts" (Japan, 2005) and "Biosleave House" (USA, 2008) suggests a certain possibility of the Avant-garde in this early 21st century art scene. Almost a century ago in Zurich during the Great War, Tristan Tzara created Dada movement with these declarations: "Dada est notre intensite"(1916), "Dada ne signifie rien"(1918). The "intensity" and the "meaninglessness" of Tzara was simultaneously accepted by Marcel Duchamp whose "Ready-made" was nothing but the expression of these notions. After several decades, Arakawa reconfirmed this attitude of "intensity" and "meaninglessness" by presenting to the public of the consumer society his "Coffins" and "Diagrams", and publishing his monumental book with Madeline Gins, "The Mechanism of Meaning" (1971). Now, at the dawn of the new century, we are going to verify the true meaning of "intensity" and "meaninglessness" that Arakawa has inherited from Dada and has developed beyond Dada. Fumi Tsukahara is a Professor of Cultural Studies and Contemporary social thought at Waseda University, Tokyo. He was born in Tokyo, Japan and studied Dada and Surrealism (Tzara, Breton, Arakawa, etc.) in Europe and Japan at the University of Kyoto where he completed his MA degree and completed his PhD at the University of Paris 3. His numerous publications include: "La tragectoire merveilleuse de Shusaku Arakawa" (2009), "AEsthetics of Revolt"(2008), “Age of Dada and Surrealism" (2003). He has co-authored "Dada circuit total" and "L'Age d'Homme" (2005) and translated Jean Baudrillard's works "The Consumer Society" and "The Symbolic Exchange and the Death". Inaugurating Ecrire l’espace (2002), the late and regretted Marie-Claire Ropars-Wuilleumier reads the title of Benjamin Perec’s Espèces d’espace with uncommon grace and tact: the poet’s inflexion of espace, following its qualifier espèces, with patience and with a keen eye and ear, can be read and heard as a site of tentative repose. Es, or “in” is cued from the first instance of the title, that is also an expression of doubt or wonder—est-ce—at the same time it is what we hear when we read the letter S. S is what caps the title, in espa –ce. Is this not what it is, “[n’] est-ce pas ce?” or S—pe—S d’ S—pa—S? The gloss shows that in the passage from espèce to espace in each of the middle syllables of the substantives two inner spaces are opened. Each recalls a kind of peace, a paix (in French in espèces) and a pa(x) (in Latin, where in elision a half-voiced x marks the spot) where we imagine a tomb of calm over which might be figured requiem in pace. Through Perec Ropars finds a peace of space. The title and its tourniquet can serve as an epigraph to this study of Madeleine Gins and Arakawa’s work on what it is to invent space. An Architectural Body and other works take what geographers and urbanists have called “the spatial turn” in unforeseen directions. First (1), for sake of explication, how, why, and along what vectors: what have “landing sites,” the “bioscleave,” the “tentative” and “pliable” modes of architecture, the “coordinating skill of walking or strolling,” or the “newborn organism-person-environment an Atlas shouldering the world in its entirety,” or their emblem of the snail (drawn from Francis Ponge) have to do with the spatial twists and turns we follow in the prodigious domain (perhaps now in crepuscule) of theory that for two or three decades has run alongside and in synchrony with experiments made with the raw materials of objects and language? For this reader and spectator, four areas mark where Gins and Arakawa move with and about theory. First (1), they enact, perform and materialize what (for want of a more specific term) Christian Jacob and others have called mental mapping, an invention of space made through an ever-ongoing psychogenesis. He or she who “persons” (the neologism is theirs) an environment goes forward and retreats, and forward again, always tentatively, in such a way to discern distinctions of here from and there. Arakawa and Gins perform the very process of “here-ing” and “there-ing”, that linguists often describe as the taking of “subject-positions” and acts deploying “deictic” agents. The mental mapping that the reader finds in their work on landing sites develops, second (2) into what historians of religion, in their work on the art of everyday life, call récits d’espace. They are modes of living and vectoring to which anyone and everyone is availed, and they bear (3) on the construction of events, that which seems vital to Arakawa and Gins’ work. In the strong philosophical and aesthetic sense events are “nexuses of prehension,” processes by which an organism that is “personing” becomes aware of the simultaneous subjectivation and objectivation of sensorial matter. The event is at the very basis of their creations, and it is exactly, by way of Leibniz and Whitehead, what Gilles Deleuze discerns in the inner pages of Le Pli [The Fold: Leibniz and the Baroque], a work on aesthetics and sensation in the modern age. It appears (4) that from this point of view the heritage of Gins and Arakawa’s inventions of events is deep and long. It is concealed in their axial figure of the escargot, the snail that has long been known to be a tactile eye, indeed the totem of the experience of an event. Reflecting on the snail in its shape and form in early modern writing on the mapping of things here and things there—on the distinction of topography and geography—we can, always tentatively to be sure, find where Gins and Arakawa establish a piece of space, along a line of divide between of what is here and what is there, that reaches back to the age of discovery, the threshold of our own moment. Tom Conley is the Abbot Lawrence Lowell Professor of Romance Languages and Literature and Chair of Visual and Environmental Studies at Harvard University. He is the author of An Errant Eye (forthcoming), a sequel to The Self-Made Map: Cartographic Writing in Early Modern France in which Prof Conley studies the relation of images to writing in literature, theory and cinema. He is also the translator of works by Marc Augé, Michel de Certeau, Gilles Deleuze, Jean Louis Schefer and others and is currently a member of the Departments of Romance Languages and Visual & Environmental Studies at Harvard University. This videotaped pas de deux will touch upon a series on themes such as: not dying as a test of seriousness; that not dying is the theme, not the practice, of most art; walking on the knobby floor of Bioscleave is practicing for the walk of agedness; and talking obsessively about everything as an art of not dying. Don Byrd— Professor of English at the State University of New York at Albany— is a poet, sound artist, and Professor of English at the State University of New York at Albany. His theoretical work deals with philosophy, literary analysis and information theory in the books Charles Olson's Maximus (1980), The Poetics of the Common Knowledge (1994) and the forthcoming Abstraction (n.d.). His books of poetry include Aesop's Garden (1976) and The Great Dimestore Centennial (1987). He was the founder of The Little Magazine. McKenzie Wark— Associate Professor of Cultural and Media Studies at Eugene Lang College and The New School for Social Research— is Associate Professor of Cultural and Media Studies at Eugene Lang College and The New School for Social Research. He is the author of several books including: Dispositions (2002), A Hacker Manifesto (2004, 2006), Gamer Theory (2007), 50 Years of Recuperation of the Situationist international (2008). He was a co-editor of the Nettime anthology Readme and, with Brad Miller, co-produced the multimedia work Planet of Noise. He lives and works in New York. This presentation begins with a critical examination of David Freedberg and Vittorio Gallese’s (2007) theory that the experience of art involves a form of simulation involving the activation of canonical or mirror neurons. I suggest that there are three problems with this view and I propose an alternative view based on the enactive theory of perception and social perception. I offer some evidence from eye tracking studies and suggest a further experiment. Finally, I apply this enactive view to architecture with reference to the work of Arakawa and Gins. I conclude: (1) In contrast to Freedberg and Gallese, our reactions to images and artistic representations of actions and objects are not of the same order as our reactions to real actions and objects; (2) Artistic/aesthetic experiences offer affordances that short circuit our ordinary engagements, and make us aware of possibilities not realizable in current or established frameworks; and (3) Architecture (ala Arakawa and Gins) short circuits the distinction between the realizable and the unrealizable – it transitions between the ready-to-hand (the experiential) and the present-at-hand (the conceptual), and in doing so is revelatory of our possibilities. Shaun Gallagher is Professor of Philosophy and Cognitive Sciences and Senior Researcher at the Institute of Simulation and Training, at the University of Central Florida (USA). He also holds a position as Research Professor of Philosophy and Cognitive Science at the University of Hertfordshire (UK). He is currently a visiting researcher at the Centre de Recherche en Epistémelogie Appliquée (CREA), Paris, and has been Visiting Professor at the Ecole Normale Supériure, Lyon, the University of Copenhagen and Visiting Scientist at the Cognition and Brain Sciences Unit, Cambridge. His research is focused on embodied cognition and intersubjectivity. His recent books include How the Body Shapes the Mind (OUP 2005), Brainstorming (Imprint Academic 2008), and with Dan Zahavi, The Phenomenological Mind (Routledge 2008). He is also the author of The Inordinance of Time (Northwestern 1998) and Hermeneutics and Education (SUNY 1992). He is co-editor of the journal Phenomenology and the Cognitive Sciences, and is currently editing the forthcoming Oxford Handbook of the Self. Since Arakawa and Gins may be considered first major visionary architects since Buckminster Fuller, much work needs to be done to understand the relationship between their notion of architecture as hypothesis, and the array of “architectural procedures” that have been elucidated in their writings. To what extent has Western architecture been grounded by a philosophy of comfort, and to what extent does the work of Arakawa and Gins not only deconstruct the assumptions of that philosophy, but delineate a new philosophy? Now there have been interesting critiques of their work from within the architectural community as early as the 1997 Guggenheim Retrospective and subsequent volume We Have Decided Not To Die, as represented by Ed Keller, Johannes Knesl, Greg Lynn and Jesse Reiser. But researchers need to situate with rigor the theories and actualized designs of Arakawa and Gins in terms of past and future architectural practices. What are the heuristic goals of their architectural procedures such as the “bioscleave fructifying procedure,” the “biotopological open code procedure,” or the “borrowed proprioception procedure.” What might these procedures have to do with the role of architecture in motivating evolutionary processes within the users of that architecture? What function do “biotopological reports” serve for those users reflecting on their embodied cognition in the worlds created by Arakawa and Gins? 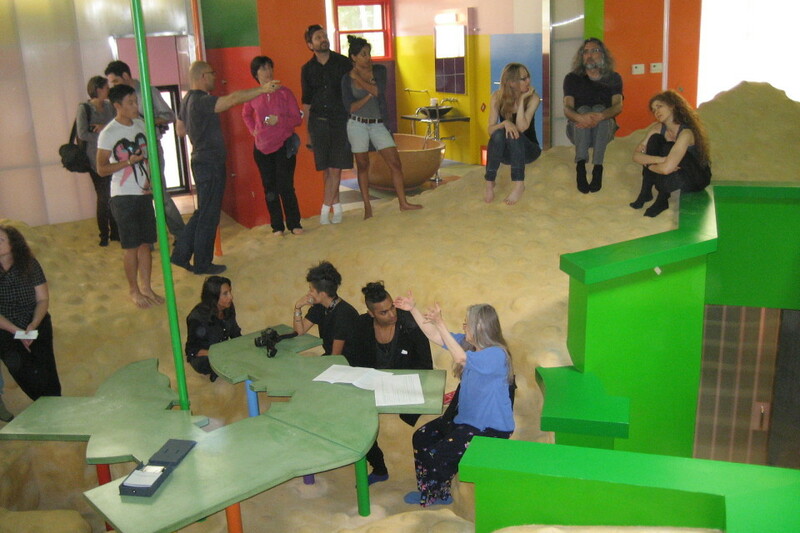 Pia Ednie-Brown : Open Wide, Come Inside: laughter, composure and architectural play. The commitment that Arakawa and Gins show by articulating both philosophy of architecture and actual architectural practices with respect to “reversing destiny,” reveals a growing and sophisticated understanding of larger social and ecological concerns over human habitation and quality of life for all living entities on the planet. Questions of health and longevity raised by saying “we have decided not to die,” and “making dying illegal,” really address not only the ways in which their architecture forces embodied cognitive processes to navigate their purposefully difficult terrains, but also the fate of human life on a planet undergoing enormous human-originating stresses, and the prayer for a reversal of destiny. 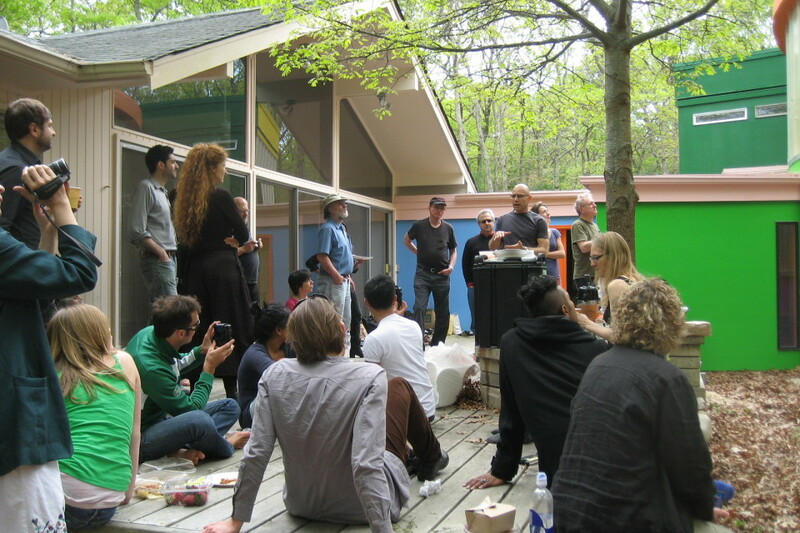 For example, the questions of toxins and the purification of the environment become raised by insisting on the interdependence of humans and their habitat through posing the hybridization of humans and their “surrounds” as “architectural bodies.” Questions addressing sustainability, their commitment to life-affirming urban design through numerous “architectural procedures,” the role that these “procedures” may have in “accelerating evolution,” as well as the role of these architectural procedures in enabling optimum neuro-biologial functioning, posing a deep relationship between the rigors of constantly recalibrating balance and the aging process, have all been raised by recent scholars addressing the work of Arakawa and Gins. Reuben M. Baron is a Senior Research Scientist and Professor Emeritus at the University of Connecticut. He is the founder of the field of ecological social psychology, a domain which involves applying the theory and research of the perceptual-experimental psychologist, J. J. Gibson to problems in social knowing including the differentiation of the role of perceptual and conceptual processes. He also pioneered the application of complex, dynamical systems to group and intergroup problems such as trust, cooperation, and reconciliation. The Baron & Kenny (1986) article ,“The Moderator-Mediator Distinction in Social Psychological Research”, recently (2008) received an award from the Society of Experimental Social Psychology as the publication having the greatest scientific impact in the last 25 years. He also organized a special issue of the Journal of Ecological Psychology around the theme “Perceiving Architecture and Art: An Ecological Comparative Perspective” in which two of the papers dealt with Arakawa and Gins’ work. He is also an art curator and art critic, serving as a contributing editor to the online journal, artcritical.com. He continues to work in social psychology, ecological psychology and art criticism. He has published more than 80 articles and book chapters and coedited a social psychology textbook. He earned his B.A. in Psychology at Brooklyn College and his Ph.D. in Social Psychology at New York University. Arakawa and Gins confront fundamental assumptions about human consciousness and embodiment, not only with reference to the philosophy of mind and more recent work in “consciousness studies.” They seem to engage deliberately with the fields of cognitive science, neurobiology, artificial intelligence, theories of self-organization and autopoiesis from cybernetics, biology, chemistry and physics, not to mention the scientific phenomena of individuation and aggregation at the heart of much research on “emergence” in both philosophy and science, as with their term “cleaving.” Many recent scholars of Arakawa and Gins’ work and writings delve deeply into the sciences in order to elucidate the sometimes obscurely hermetic vocabulary in Arakawa and Gins’ writings. They have found powerful resonances between the articulated issues in their writings, and those issues addressed by philosophers of science and scientists who seek to rethink the relationship of the human body and its cognitive processes with the world within which it finds itself embedded. The perhaps false distinction between embodied and distributed cognition when dealing with an “organism that persons” that negotiates the “architectural surround” through the construction of tentative “perceptual, imaging and dimensionalizing landing sites”; the relationships among sensory, proprioceptive, memory and conceptual cognitive processes with respect to questions of situated awareness associated with their terms “biotopology,” the relationship between their concept of biotopology and the N-dimensional geometries deployed recently by scientists to model cognitive processes–all come under their purview. Takashi Ikegami received his doctorate in physics from the University of Tokyo in 1989. After being granted his doctorate, he began intensive study of self-reproduction, evolutionary theory and game theory. Some of these results were published in "The Evolutionary Scenario of Complex Systems," from Asakura Publishing. Currently, he is a professor at the Department of General System Studies, also at the University of Tokyo. His research is centered on complex systems and artificial life, a field which aims to build a theory of life using dynamical systems perspectives. In 1998 his research interests shifted to embodied cognition and evolutionary robotics. Recently he has been working in a collaboration focused on chemical experiments involving self-moving oil droplets, and also on using autonomous robots to understand new concepts of biological robustness. Some of these results have been published in "Life Emerges in Motion" from Seido Book Publishers in 2007. Takashi Ikegami frequently attends the International Conference on Artificial Life, and gave the keynote address at the 20th Anniversary of Artificial Life conference in Winchester, UK. He is a member of the editorial boards of Artificial Life and BioSystems. As in many of the above topic streams, the question of translation confronts how Arakawa and Gins’ language blurs the distinction between possible and impossible semantic structures. So not only do we hope to encounter scholars grappling with the problem of translating the writings of Arakawa and Gins (as well as Madeline Gins’ poetry), but to also ask fundamental questions about their semantic tactics of cross-disciplinary and cross-cultural conceptual daring associated with their notion of “terminological junctions.” How might one translate into other languages, and other cultural contexts, conceptual clusters that themselves bridge many worlds simultaneously? Marie D. Garnier, is Professor of Anglophone Literature and Gender Studies at the University of Paris 8-Vincennes, France. Her recent publications include a co-edited volume, Cixous sous X: d’un coup le nom (Paris, Presses de Vincennes, 2010), and several articles on literature and the philosophies of difference from Derrida and Deleuze to Lyotard. Her main field of research is at the intersection of philosophy, literature and gender studies. Recent publications include articles on Derrida and the animal, on Cixous and haecceities, on the poetry of James Joyce (forthcoming) and on Gins and Arakawa. She teaches courses and seminars in Gender Studies, in queer writing and translation. She is currently working on the translation of Madeline Gins’s Helen Keller or Arakawa (Burning Books, 1994). The work and writings of Arakawa and Gins have engaged with major issues in philosophy and linguistics: from Japanese Zen Buddhism through writings of Dada and Surrealists, to Wittgenstein; from mid-century existentialism, contemporary social philosophy associated Derrida and Foucault, and the postmodern turn of Jean Francois Lyotard, back to the genealogical threads originating from the work of Freud and Nietzsche; from the notebooks of of Marcel Duchamp to the work of Marshall McLuhan and that by Mark C. Taylor on religion and media philosophy, and the tradition of “becoming” associated with Henri Bergson, Maurice Merleau-Ponty and Gilles Deleuze and Felix Guattari. Yet, one can say that many of these figures have, in turn, been influenced by Arakawa and Gins’ work and writings: Lyotard, Taylor, and at least the followers of Deleuze and Guattari, such as Brian Massumi and Erin Manning—all have referred to Arakawa and Gins’s work in their ground-breaking writings. Furthermore, their writings often tackle through language games the grounds for any linguistic practice by making visible “the mechanism of meaning,” and the linguistic, philosophical and legal problems posed by impossible verbal constructs, such as “Making Dying Illegal.” We welcome any explorations of the many intersections between these artists and the fields of philosophy and linguistics, and especially ask for new and unsuspected alliances. Gregg Lambrert : What Counts as a Closely Argued Built-Discourse? Gregg Lambert is Dean’s Professor of Humanities, and Founding Director of the Humanities Center, at Syracuse University. He received his Ph.D. in Comparative Literature and Critical Theory from University of California at Irvine. His current works-in-progress is entitled Globalatinization: Of Christianism, Essentialism, and Euro-centricism in Our Philosophy; and, The Other Person and the Possible World. He is the author of numerous monographs and edited collections. His 2008 On the (New) Baroque is an expanded paperback edition of his highly acclaimed Return of the Baroque in Modern Culture (Continuum 2005). His other volumes include: Who's Afraid of Deleuze and Guattari? (New York and London: Continuum Books, January 2007). The Non-Philosophy of Gilles Deleuze (New York and London, Continuum Books, November 2002). Report to the Academy: re the (new) Conflict of the Faculties , in "The Critical Studies in the Humanities Series," ed. Victor E. Taylor (Davies Group Publishers, August 2001); available in paperback from Amazon.com . Co-editor with Eugene B. Young of the forthcoming, The Deleuze and Guattari Dictionary (London: Continuum Books). In Preparation. Co-editor with Aaron Levy, "Rrrevolutionnaire! ": Conversations in Theory vol. 1 (Philadelphia: Slought Foundation, 2006). Co-editor with Ian Buchanan, Deleuze and Space (Edinburgh: University of Edinburgh Press, July 2005). Co-editor with Victor E. Taylor, Jean-François Lyotard: Critical Evaluations in Cultural Theory, 3 Vols. (London: Routledge, January 2006). The volume Architectural Body appeared in the University of Alabama Press series on Poetics, and speaks to the range of talents that Arakawa and Gins bring to their theoretical writings. It speaks as well to how influential this work has become for poets and for the cluster of theoretical humanistic writings that come under the rubric of “poetics.” Madeline Gins’ reputation as one of the leading lights of what some call “language poetry” reveals one possible source for the constant word play, for example, the semantically impossible constructs such as the title of their second manifesto Making Dying Illegal, which seems to give license to concepts that seem simultaneously forbidden and mandatory at the same time. We should encourage further research on the tactical as well as conceptual sources of some of their tactics in Madeline Gins’ books of poetry, as well as in the visual and verbal play of earlier Mechanism of Meaning, not to mention the interstices of the verbal, visual and conceptual in Arakawa’s earlier visual art. Scholars have addressed the role of the impossible verbal construct, the poetics of movement in skewed space, the relationship between contingency and constraint, “the approximative-rigorous abstraction” and embodied experience, in phrases like “A Tentative Constructing towards a Holding in Place,” Furthermore, the role of the manifesto itself comes under scrutiny, by bringing to the foreground the relationship between theory and practice as a prescriptive or descriptive process; certainly, neither Architectural Body and Making Dying Illegal draw a line in the sand between the two. If we can understand how Arakawa and Gins progressed from their initial roles as masters of conceptual art to become serious contributors to the debates about ecology and sustainable living, then we may come to terms with the educational role of the avant-garde as a “tactically-posed” conceptual domain. But Arakawa and Gins mean to enact embodied cognitive experiences that short circuit the distinction between conceptual and experiential learning. To what extent do the terms “hypothesis” and “procedure” require separate treatment as pedagogical tactics, or as goals in and of themselves? How might the work of Arakawa and Gins open up new domains of research in the education of children? This question has been raised by Bobby George, who as a co-director of a Montessori school in Sioux Falls, South Dakota, is seeking to deploy their architecture for what Arakawa and Gins call “accelerating evolution,” mutually transforming both Montessori philosophy, and Arakawa and Gins’ architecture. To what extent might Arakawa and Gins’ term “Directions for Use” involve tackling problems of ageing, or has the term more global implications for adult education and adult development? Gordon C.F. Bearn is a Professor of Philosophy at Lehigh University in Bethlehem Pennsylvania. He has published a Nietzschean reading of Wittgenstein called *Waking to Wonder – Wittgensteins Existential Investigations* (SUNY 1997). He has published articles on Cavell, Wittgenstein, Derrida, Deleuze, Le Corbusier, and Arakawa/Gins. He is completing a Deleuze-inspired book on making your life beautiful called *Life Drawing – An Aesthetics of Existence*. He is also starting a new project on sensual experience, both linguistic and nonlinguistic experience, and he finds *The Mechanism of Meaning* to have been almost everywhere first. The scope and impact of AG3 can be indicated, in a blunt way, by a few statistics. There were 4000 users (separate IP address) logged into the website over the 14 days of the online conference equating to 2000 and 3000 people if some logged in from home and work. The number of hits (accessing pages and movement from page to page was in the millions), but more interestingly the number of sessions for the conference, defined as a user logged in for at least an hour, was almost 500 per day and on the first weekend of the conference when between 800 – 1000 sessions were logged. Martin E. Rosenberg, co-organiser of AG3-Online, is an independent scholar, specializing in the cultural implications of science and technology. He has focused mainly on the history of "emergence" in science, philosophy and the arts: Poincare, Bergson and Duchamp; Pound, and the epistemological foundations of fascism in reversible models of time; the novels of Thomas Pynchon, the Nobel work of Ilya Prigogine in chemistry and physics, as well as the cognitive science of Humberto Maturana, Francisco Varela and Edwin Hutchins, and the philosophy of Gilles Deleuze. He has authored numerous articles on Deleuze. His current research involves the relationship between theories of emergence in cognitive science, and the possible link between embodied and distributed cognition, through research on parallel processing with computers, jazz improvisation, cinema and the architecture of Arakawa and Gins. As a theorist, he has written on the relationship of metaphors (tropes generally) and epistemology, and the cultural work or agency of metaphors in trans-disciplinary inquiry. He has had a sideline in theories of hypermedia design, especially the role of metaphors in the design and implementation of information systems. He has written on physics and hypertext, on the role of complexity theory in the design of icon-driven interfaces, and on the modelling of the problematics of transdisciplinary inquiry in hypermedia. He is the co-creator of The RHIZOME Project_1989-92 (with Thomas I. Ellis); _Chess RHIZOME_1998-9; and the Multi-object Oriented, Multi-User Domain classroom space MER's Fungal Palace at the Media Lab at MIT (1996-8). He was originally trained in classical composition and jazz arranging and performance, has authored over thirty jazz compositions, and has recently committed to practicing until he's able to play and record again! Trish Glazebrook, Professor of Philosophy at Dalhouse University in Halifax, Canada, and is cross-appointed to the School of Resource and Environmental Studies, International Development Studies, Gender and Women’s Studies, and the College of Sustainability. She received her PhD at the University of Toronto and publishes in Heidegger studies, ecofeminism, ecophenomenology, development studies, ancient philosophy, and philosophy of science and technology. With a monograph on Heidegger’s philosophy of science and editor of several collections, Patricia has established herself as one of the premier eco-feminist philosophers of science. Her current research focuses on women subsistence farmers in developing nations, with particular attention to climate change vulnerabilities and impacts, resilience and coping strategies, and gender mainstreaming in climate policy. Russell Hughes, PhD Candidate/Sessional Lecturer, RMIT University. Russell Hughes’ research on Arakawa and Gins began in 2005 when he presented at the 1st International Arakawa and Gins conference at The University of Paris X Nanterre. Building on the themes of this conference Russell’s PhD thesis titled Ageing Biology, Immortalist Biopolicy, Promethean Biotechnology and a Diminishing Biosphere: The Ageing of Aquarius, Armageddon and Arakawa and Gins, is due for submission early 2010. Teaching at RMIT University in the School of Architecture and Design, Russell is a Centre for Sustainability Leadership 2009 Fellow whose work seeks to understand how Arakawa and Gins can be applied to the contemporary biopolitical context, both as an architecture to sustain human beings and as a heuristic device through which we might come to practice sustainability with the critical ecology of the earth. Bobby George is currently a PhD student in the Department of Philosophy at Goldsmiths College. He is completing a primary dissertation entitled 'Orson Welles: An Aesthetics of the Earth' and a secondary dissertation entitled 'I Love Arakawa and Gins: Forever, Always, Now; Or, Arakawa and Gins: Philosophers of Life.' Most recently, he has been on leave in Sioux Falls, South Dakota where, with his wife June, he has established The Baan Dek Montessori. Inflexions journal: Special thanks to Erin Manning and Brian Massumi the founders of Inflexions journal, Inflexions staff especially Leslie Plumb the interface and issue designer, Toni Pape and the rest of the editorial committee. Curators of the Creative Responses for AG3 Online: Bill Lavendar, Alan Prohm and Jason Nelson. The Architectural Body Research Foundation: Special thanks to Joke Post and staff, NY, NY and to the staff of Reversible Destiny Lofts Mitaka, Tokyo with special thanks to Momoyo Homma. Matt Story for his editorial assistance. Griffith University: Prof. Andy Bennett, director of the CCR at Griffith University and the Centre Manager, Sarah Gornall as well as the Information Services Technical team of Sarah Vardy, Heidi Perrett and Jeroen van den Muyzenberg. At the Guggenheim event: Martin E Rosenberg, Alexandra Monroe and the Guggenheim staff.